Spent time sneaking up on a pair this afternoon. Got within 60 feet or so and they had enough. Shot a couple pics before they were gone. Once in awhile the TCON-14B has the FZ20 "hunting" for focus.Lately Imanual focus when using it. This shot is a hair off. Used aperature priority at F5.6 at 12x (around 17.5x with tele). looks good. Did you post process? Yes, Unsharp mask in Paint Shop Pro. Rotated it a little too as the river's edge was a couple degrees off from horizontal. Nice picture. 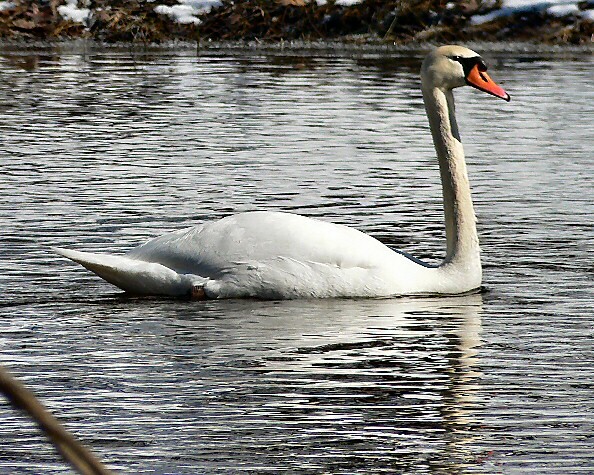 The exposure looks pretty good given the all white nature of the Swan. It tough to get good detail throughout the whole bird. I like it. I was using the smallest center autofocus setting. I have the FZ20 set to manual focus and pull the button down to let the camera do one autofocus. I then tweak it with the focus ring. I have a few pics I've taken using just autofocus with the 14b that seem soft. In some situations the camera while trying to autofocus goes way in and then way out and then finally comes close to focus. style="BACKGROUND-COLOR: #000000"Maybe I should try the larger center autofocus setting. Hmmm. Anyone have any other suggestions using the same tcon-14b? style="BACKGROUND-COLOR: #000000"BTW, I am pleased with this lens. Even if I had to manual focus EVERY pic with it, the $ difference over the Panasonic version is worth it in my opinion. Theextra $can be used for other stuff: good tripod, filters, etc.